~God is not only knowable, He wants to be known. Thatâ€™s the idea behind 30 Days to Knowing God Better, a great compilation of classic Christian writings. Text is lightly updated for ease of reading and explains the whyâ€™s and howâ€™s of connecting with God. 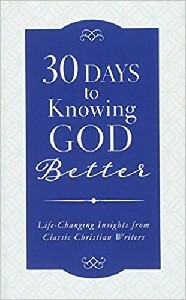 With scripture references for additional reading, questions for further thought, and writing space for recording observations, 30 Days to Knowing God Better is useful for both personal and group study.